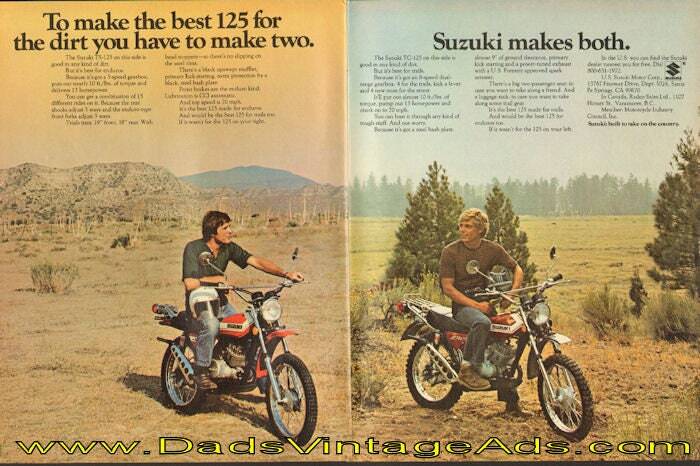 Suzuki makes both. The Suzuki TS-125 on this side is good in any kind of dirt. But it's best for enduros. Because it's got a 5-speed gearbox, puts out nearly 10 ft./lbs. of torque and delivers 13 horsepower...The Suzuki TC-125 on the other side is good in any kind of dirt. But it's best for trails. Because it's got an 8-speed dual-range gearbox. 4 for the trails, kick a lever and 4 new ones for the street.